Lower PE and PP prices have helped stabilize those markets, although ample PE supply could result in further decline. Feedstock volatility and unplanned outages appeared to put some upward pressure on PS and PVC, though any actual movement was far from certain. Further downward pricing is projected for PET, driven by oversupply that is only likely to grow. These are the views of purchasing consultants from Resin Technology, Inc. (RTi), Fort Worth, Texas, CEO Michael Greenberg of The Plastics Exchange, Chicago, and Houston-based PetroChemWire (PCW). 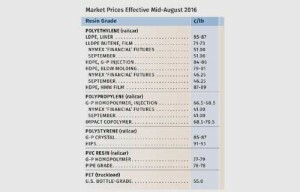 In late July, the Plastics Exchange’s Greenberg reported very solid demand across the entire slate of PE products. He noted that continued production issues had limited supplies of most LDPE and LLDPE grades, which “dashed hopes for contract price relief in July.” HDPE for all processes was more readily available, though still in limited quantities. Similarly, PCW reported that domestic prime orders were healthy in July, while exports were relatively quiet because U.S. prices were not competitive in many cases, particularly for LDPE and LLDPE. Newell further projected that PP pricing could resume following the monomer’s price trajectory as it had typically in the past. Newell also noted that PP suppliers used export markets to get rid of some of their excess material, which amounted to a 200-million-lb net inventory build during the first half of the year. In June they reduced that by 30 million lb. “Imports continued to have an impact, so spot prices in secondary markets were much lower than premium—by as much as 10ȼ/lb.” Still, by July’s end, Newell expected lower import volumes and bottoming-out of spot prices. Greenberg reported that the flood of imports earlier this year that changed the PP market from tight to loose appeared to be concentrated on copolymer PP. “The more recent oversupply has been from domestic homopolymer PP. As the overall bearish market languishes, those importers that tried to wait out the trough have begun liquidating unsold inventories that they had previously tucked away. Packaged copolymer PP is now nearly as plentiful as homopolymer. This seems to limit a quick rebound,” he reported in late July, referring to the spot market. Polystyrene prices were flat again in July, but at least two suppliers issued a 2ȼ/lb increase, which could have some teeth, according to both PCW and Mark Kallman, RTi’s v.p. of client services for engineering resins, PS, and PVC. The key driver was July and August benzene contract-price increases, totaling 26-29ȼ/gal. Kallman attributes this to a tight benzene market made worse by a lowering of benzene imports. Moreover, a snugger PS market due to steady demand and unplanned production shutdowns lends support to a price increase. Total Petrochemical, which declared force majeure in late June at its Carville, La., styrene and PS plant due to an electrical failure, was restarting in the first week of August. According to PCW, the tightness was evident in offgrade GPPS and HIPS. PVC prices stayed flat for the third consecutive month in July, after moving up a total of 6ȼ/lb in March and April. Suppliers were still trying to push through their June 3ȼ/lb increase, according to RTi’s Kallman, who indicated some complexity as to how this could go. On one hand, the early July force majeure declared by Westlake Chemical at its Kentucky plant created a tightness, but one mainly affecting the export market, explains Kallman. “Domestic demand has been steady but no one had trouble getting material. However, there was less material for the export market, for which prices had to go up.” This put some upward pressure on domestic prices, too. On the other hand, if there is a continuation of lower crude-oil prices, this will be disadvantageous for export demand, and a more than amply supplied domestic market could push PVC prices downward. Domestic bottle-grade PET prime resin prices in July averaged 55.75ȼ/lb, down 0.75ȼ/lb from June, based on PCW’s Daily PET Report. This represents PET resin on a delivered Chicago basis. On Aug. 1, it was 55ȼ/lb. Meanwhile, U.S. imported PET (packaging grade) averaged 50.0875ȼ/lb in July, down 0.9125ȼ/lb; the price on Aug. 1 was 50ȼ/lb. This represents imported PET resins on a delivered duty-paid U.S. port basis. Prices for both were expected to be pressed even lower in August due to a familiar scenario—plunging crude oil prices and its effect on the PET feedstock chain, said Xavier Cronin, senior editor of PCW’s PET Daily and Weekly Recycled Plastics reports. “There crude goes again,” he remarked, referring to the drop under $40/barrel for the spot NYMEX contract in intra-day trading on Aug. 1. The glut of prime PET in the U.S. (not to mention an abundance of recycled PET pellets) has emerged just as what’s touted to be the world’s largest PET plant is expected on line soon. M&G Chemicals is sticking to its timetable for startup at the end of this year of its 2.4-billion-lb PET complex at Corpus Christi, Texas, though a more realistic timing might be the first quarter of 2017. PET feedstocks for July were all lower: paraxylene at 41ȼ/lb, down 0.75ȼ from June; PTA at 42ȼ/lb, down 0.44ȼ; and MEG at 36.02ȼ/lb, down 0.04ȼ.